Today’s video episode is about a FREE 15-MINUTE CALL. This can be valuable for you if you’d like to actually speak with me. And this is also going to be valuable for you if you’d like to figure out how​ you can use free calls in your business. 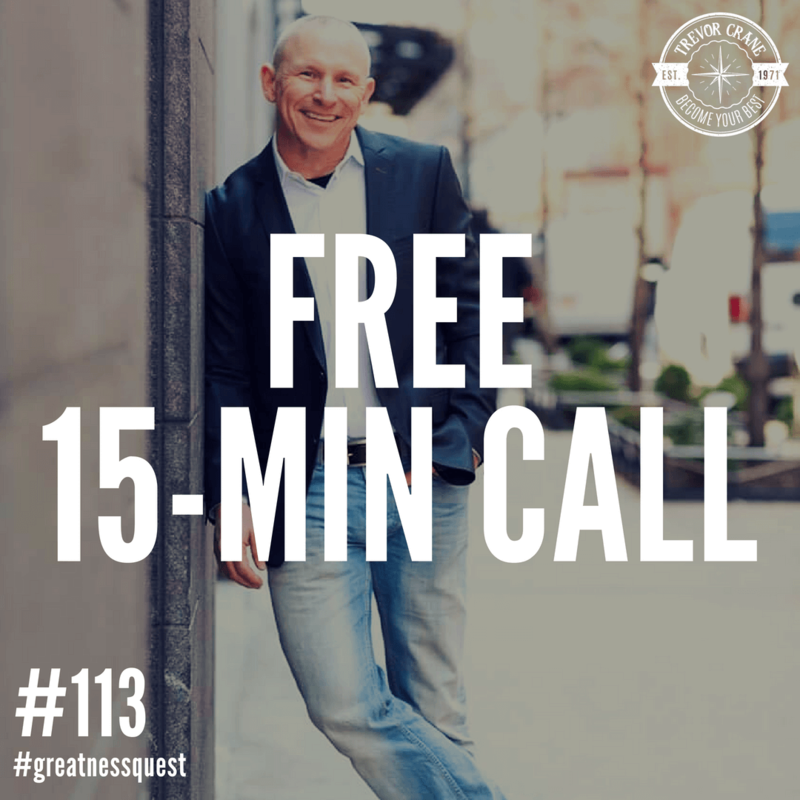 Today, I’ll give you a little pre frame about how I use free calls, and​ how you can use them to serve you and serve the people you want to help. There is POWER in stories. How do you use STORIES to influence people? How do you use them to influence YOURSELF? What’s your MESSAGE, and how do you SHARE it with other people? Do you have a PROFITABLE PATH to MONETIZE your MESSAGE? And, if you’d like to jump on a FREE phone call with me, I’ll help you create a plan and a path to help you: CLARIFY YOUR MESSAGE, so you can CHANGE THE WORLD. NOTE: We do things differently. This is a new opportunity for you to learn the the right way and the best way to tell your story. Hey guys welcome to another daily dose of greatness quest. This is Trevor Crane. And it’s another video episode, so if you’re listening on audio go check us out at trevorcrane.com​ or on YouTube and can’t wait for you to see today show. It’s about free 15-minute call. So this can be valuable for you if you’d like to actually speak with me. But this is also going to be valuable for you if you’d like to figure out how you can use free calls in your business. And I’m going to give you a little pre frame about how I use them and how this might go ahead and serve you and serve the people that you get to do these free calls with. So guys, I decided to make that today’s episode because a couple days ago, I shot this video. That’s a pregame to what I want people to focus on before they do a free call with me. And I thought that would be valuable. 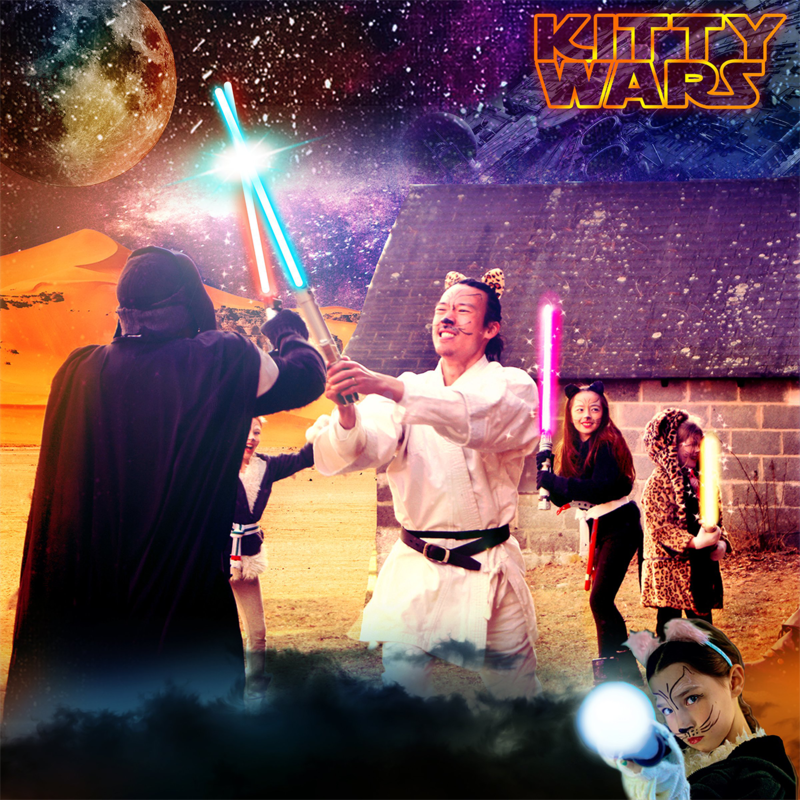 And it’s also another way that I can repurpose the same visit video and give it to you. But the thing is, I’m in my office because I’m about to shoot two more videos. I’m going to shoot a training and webinar. 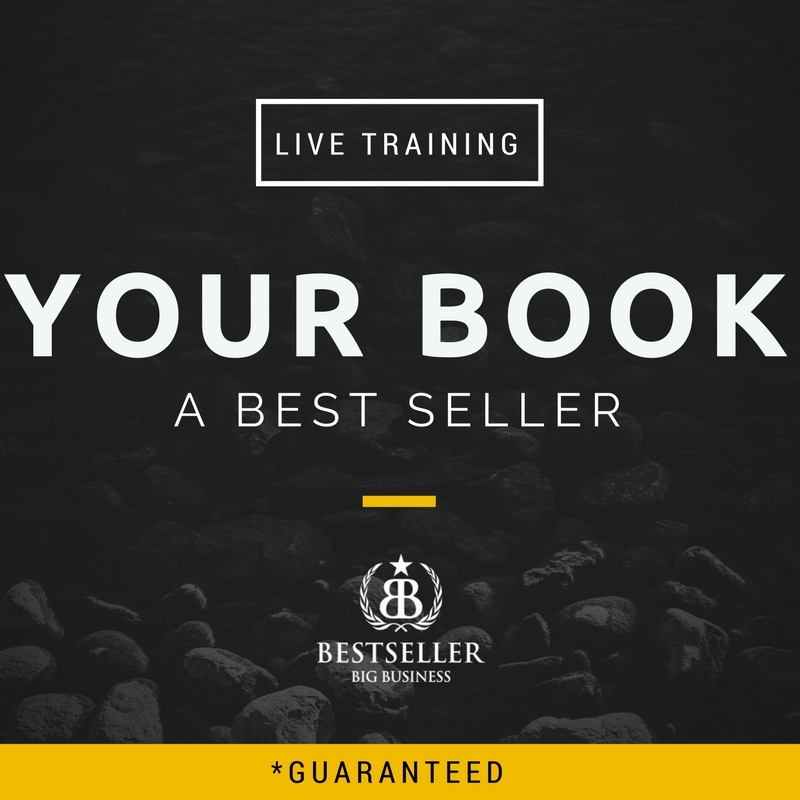 That is my program called How to Go from Blank Page to Bestseller in 90 Days or Less. And I’ve got new cool stuff that’s going to go in there and a new offer on the back end of that webinar. Now, in the past, I used to drive a lot of people to jump on a phone call with me. So a lot of my marketing one of my books on my websites and even the webinar that I used to have said, Hey, if you want help, you’ll talk with me or one of my head coaches. Jump on a free call. And what I thought might be valuable for you is to share with you this video that I just created. Because it can help you understand. Like, I want people to get some value before they show up on the phone call with me and to know what’s going to happen on this free phone call. So if you watch the rest of today’s show, you’re going to see that video, the video that I give people who want to book a free call with me and it’s about 13 minutes long. And it’s a little bit about what to expect and how to get the most out of it. And the free phone call context is if someone wants to grow their business or write a book and typically around storytelling and books and using that in their brand. And so I give this as a pre frame so you might want to look at this as a little bit of a template or tutorial that you could use if you want to book free calls for someone to meet with you and I that the other reason that I’m doing this is that you are subscribing to my podcast right now you’re taking the time to follow me in this daily mentoring program and be cuz you’re so awesome. I’m going to give you this gift because I’m taking the free phone call for most of my free phone call stuff out of my funnels is about to become a thing of the past. And if you’re watching today’s show, then this is you still get access to it so if you want to book a free call with me. It goes straight to me this isn’t with one of my free code my coaches. This is just with me and this pre frame of the rest is video kind of tells you what we’re going to do on the call so if this seems like it’s going to be valuable for you you should book a call with me and you can go to you know what if you go to epicauthor.com/intro​ that’s ​epicauthor.com/intro​ you’ll see this video just a 15 minute video on its own. And then there’s a button underneath to reschedule an appointment and so I just that’s what I advise that you go click and do like go to that button. You can set your appointment you can watch this video, make sure that it’s a good fit for you. And that’s about all I got for you today is I would challenge you that if you want to become a good storyteller, if you want to, in some way, learn how to influence others with your message, then it might be a good idea to attend my new webinar which I’m about to shoot in this room. It might be a good idea to jump on a phone call with me so I can share with you how I help people do that. Because I’ll give you a game plan and a blueprint and I’ll help you do that. And something I’m pretty good at. We’ve now helped a lot of clients do this. And we have a different way of looking at your storytelling. A lot of people get focused on their story and writing a great book and they do that first but in fact you’re getting it backwards and you’re getting it wrong there’s a different foundation and this is a new opportunity for you a new opportunity to learn the the right way and the best way. And what all of the best influencers on the planet are actually using its mission first, it’s not your story first. It’s it’s a monetization plan first, it’s not that you write your book first. It’s a marketing plan for her it’s not that you just go out and tell everybody your story and then ask for money. And so at any rate, I hope that you like the rest of today’s show. It’s just going to be the 15-minute call with a call to action at the end of my typical clothes. And that’s all I got for you today. 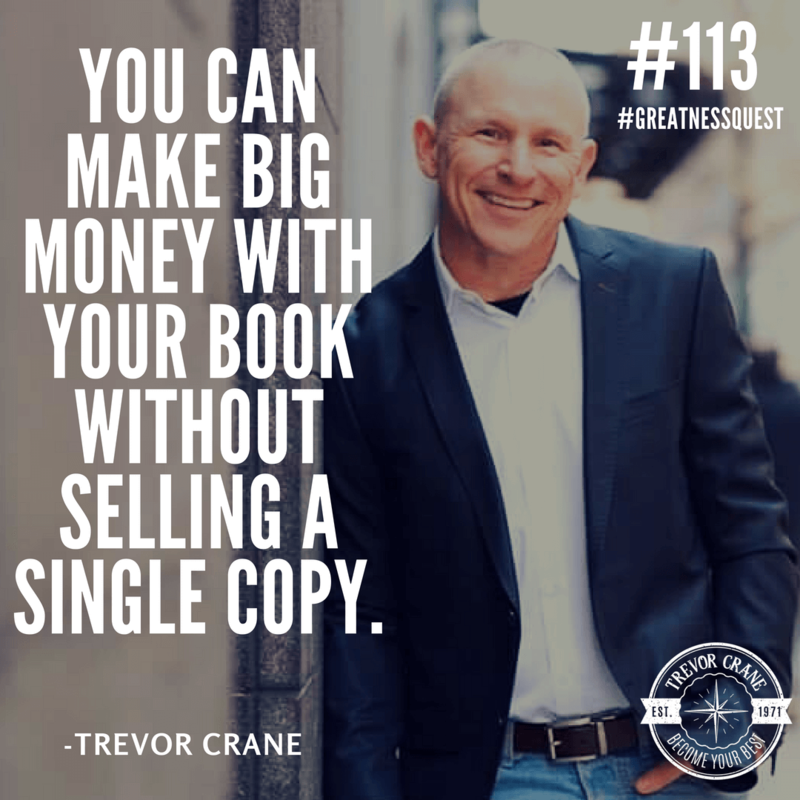 Make today magnificent and we’ll put in a cool you know what I’ll tell you what the quote of the day is “You can make big money with your book without selling a single copy”. That’s a quote of the day. I hope you loved the show and I’ll see you tomorrow on another daily dose of greatness quest. Trevor Crane here. I know we just booked a phone call with each other and we have 15 minutes which is a really short period of time. So I wanted to make this quick video for you so you could get the most out of our time together. Now typically, people want to talk to me on this call because they want to work on their book and they want to grow their business. They’re interested in getting more leads. They’re interested in having a tool that becomes our most powerful marketing tool so they can stop chasing their clients and have them coming to them. It positions your authority, your credibility, and it builds trust and desire for your ideal client to find you and then want to work with you. And I’m really excited to be able to share this with you. Because for over 20 years I struggled to make this happen. I thought I would write a book about this. And then I thought I’d read a book about that. And I failed. And I did this in a lot of different ways, really, really poorly until I did like what you’re about to do, which is to talk to me, I hired a mentor who helped me walk through the process. And that’s what I want to give you a little insight here because depending on where you are, I want to go ahead and share with you how we can get the most out of our call together. And by the way, when I finally got my first book done, you might have already heard me talk about this, I was able to 10 x my income. So if you want more extra money, my wife and I were able to both write books and within the first 12 months, we added a zero to the back of our income. I just want you to imagine what that would be like and why I’m so excited to help you build a powerful marketing tool that does all that. So let me go and give you a couple of examples here.Got you in my office, I want to go ahead and just adjust this so that we can connect. So here we go. So typically, the people that I speak with are going to fall into one of three different categories. The first being someone who has the idea, they like, you know what, I’ve got this great idea. I know, we want to, I want to write a book. I know it’s going to be valuable to me, and I know that I need it. And I think I know what I want it to be about. But you haven’t begun yet. 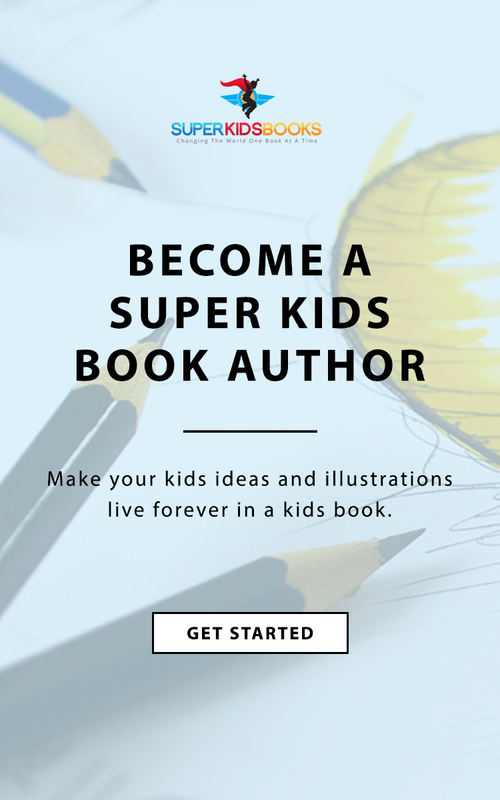 Maybe you just had these ideas and you want the confirmation that your idea is going to make a good book, the right book, and I think that that’s really important. I have a lot of people who come to me who wrote the wrong book, and they’re just confused about how to use it. And it doesn’t help them in their marketing. It doesn’t help them with their message. It doesn’t help them with their mission and then they’re not making money. So number two is I have people who have actually started writing their book they’ve gone ahead and said, You know what, Trevor? I I’ve been writing. Writing someone got me all inspired. And that’s supposed to be a pencil in the writing there. You already have worked on this project. And I’m going to tell you a quick story about Steve and he came to me like this and he said, Trevor, my manuscripts basically done them 70% done. So maybe that’s, you know, I, what I want to do on this phone call is which one of these is more like you so I can help you the most. And then the third type of person that I oftentimes find I’m doing phone calls with is someone who already has their book done and what their challenges is that they want to make money. So they’re like, you know what, I’ve got this thing done, but my marketing isn’t right. I’m not monetizing it. And I want to make money so their book is done and they want to make some money. But here’s the challenge is that everything they’re trying or whatever they’re trying isn’t working well enough, so they’re not making the money they want. So I’m going to want to know from you which of these three you fall into, like where are you now? Do you just have an idea? Are you working on your manuscript? Or is your book already done? Ad you’re just trying to, maybe you’re trying to finalize and publish it, maybe you’re just trying to make money with it, or go out and help more people. I don’t know what it is for you. But regardless of where you end up here, there’s a similar process. Like before, I’m going to give you any advice. We want to get a plan together. And if you think of building a house, let me give you another example. If you think of building a dream house, Okay, I’m gonna draw house here and you’re going to build a dream house, you’re going to want to have a plan or what we call a blueprint. Before you get started. You’re not going to go down to Home Depot and buy wood and just start nailing stuff together and in your backyard. Nothing you build in your backyard is going to make it into your book. 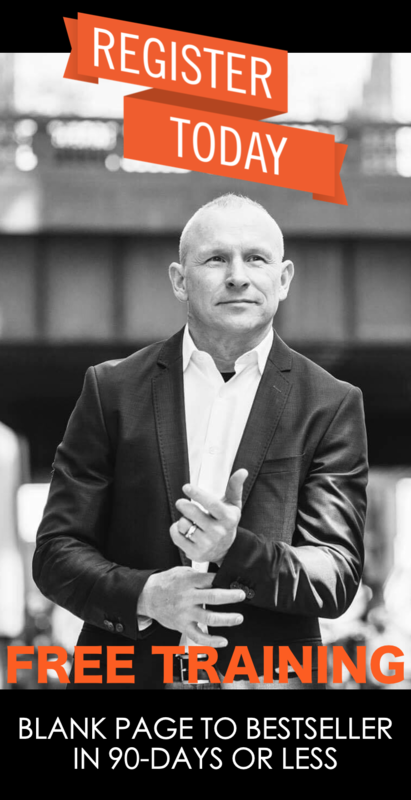 So the first thing we want and like I said, maybe you’re wanting to talk to me about a book and how you can leverage your message into your marketing but what you’re going to want is a blueprint. I know that’s hard to read. But that says blueprint, I probably should have written in and blue. But here’s the thing. A lot of times people think that there’s a problem here. And one of the problems is that you’re going to have to invest a lot of money or that it’s going to take you a lot of time. So it’s either time or money is oftentimes the thing because we don’t want to get your book done, or build your marketing and have it be really confusing and overwhelming and take you a bunch of time. So let me tell you a couple of stories about how I’ve helped people just like this to see if this helps resonate with you. So you have an idea of what’s coming. So first of all, I’d like to tell you about I’ll use a different color pen. I’d like to tell you about Lisa. Now Lisa came to me, Lisa, who had she had an idea and she said “​Trevor, I would like to write a book. I’ve got I know that I need one. I don’t know exactly what it is, but I’ve got the doggone idea I know that It’s going to be the right thing for me to do. But what should it be about? And so we met and I gave her the I’m going to write this one on the right color ink here. I gave her a blueprint. And this is what’s really special about the blueprint that I gave her the blueprint was not to go restart writing her book the blueprint was actually a message it was for her. What can she say to other people to start marketing and make money with her message? Now Lisa just had an idea, but she took the coaching that we had on our one of our first calls and actually after a blueprint session, and she applied what I shared with her and she made $12,000 in her first 30 days. And you might think that’s okay, that’s cool. But I’m not Lisa and I don’t have something to sell like that. Maybe that’s not going to work for me because I need to get my book done. I get it but Lisa didn’t have anything to sell before that either. What we did is I helped her package something that make a good offer and actually the month before two months before she just started working with me. She was losing money and had been for like a couple of years. She started working with my wife first. And then what ended up happening is we did get her book done. It took about six to eight months, we finally finished her book because she did so much marketing and messaging and build a brand new audience yet started from nothing until she wrote her book. And her book came out and it was an immediate number one bestseller, and she has a two page spread this coming out in Oprah Magazine, or it’s already out by now. I’m not sure exactly when it’s coming out. She has got new keynote speeches. She’s build an online community. And she started from zero and nothing but an idea and so I want to share these stories with you because depend no matter where you are starting out, I want to give you a handle on how I can support you. Now, the second person I’m going to tell you about you, Steve, and Steve is a buddy of mine. And he and I have known each other for years and you seem to be nice to Trevor my books almost done, but the big problem I have is time dude I don’t have the time he’s like I’m 80% Welcome, 70% done and I just want your help to publish it. And you just helped me publish it. And after asking him a few questions, we decided that rather than taking all of us speaking, and all of his webinars and all these things that he had transcribed and putting it into a book, it was easier to start over from scratch. And the big thing with Steve is that he wanted to make sure he spent time with his family because he didn’t want this book to take away from his business because he was just starting over his business. And he wanted to make sure it didn’t make the mistake that he had done the last time he had built his business. So our goal with Steve was to help him write his book in 24 hours or less. So I share this with you because oftentimes, people come with a great big manuscript, they come with all this content and then we end up doing and I don’t know what your situation is going to be. But for Steve, it was faster once we got clarity to start over from scratch, start marketing and messaging and making money and he had people sending him money and checks and he made more money make you in the beginning the first 30 to 60 The days of our program, then it cost him to do it. His book came out number one international bestseller in four different countries he had my favorite story is about how he had someone send them a $5,000 check just to reserve the right to work with him before he’d written one word of his book. So he got his book on, it became a phenomenal tool for him in his business. 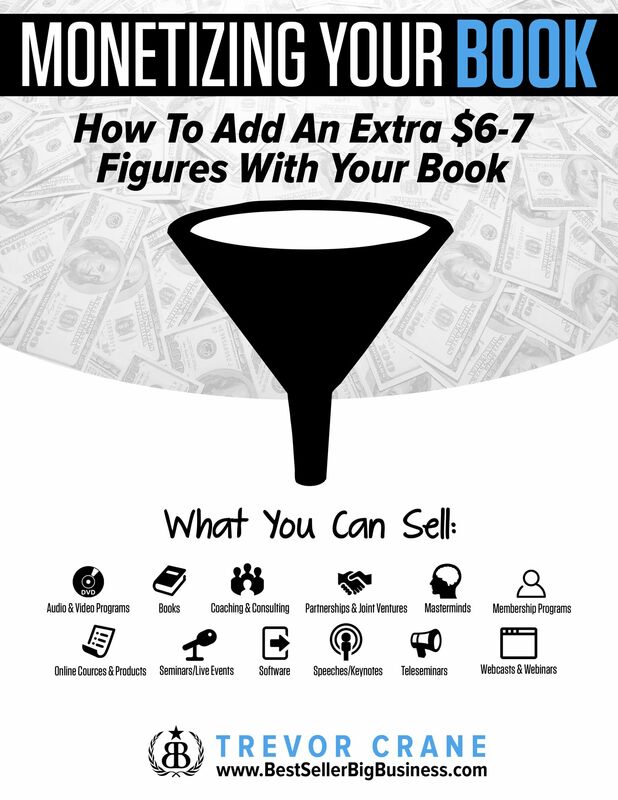 He broke seven figures, and this has helped him build a multiple seven figure business. And all of that happened when he came to me with the idea of a manuscript but we got clear about a blueprint. And then these things became possible. And by the way, we had him track his time he spent less than 24 hours and actually, I don’t know, because I didn’t get the final maybe was 26 hours, maybe 28 hours working on his book because he tracked it, this is how long it took him to get the content out of him. There’s a little more work that needed to be done to format it and get everything done. And I was like, “That’s excellent.” And on the first call after she hired me to work with her to help her with this monetization and marketing. She worked with me for six months was her first commitment to work with me. We looked at her manuscript and asked her a few questions. And she said, No, Trevor, right. I think I wrote the wrong book. I think I’ve spent the last year or two working with other writers. And this manuscript is not what I should be publishing, and so I didn’t tell her that I didn’t judge her. What I did was asked her questions to give her clarity. And she went, oh, we’re gonna have to start over from scratch. And we didn’t do that. Exactly. We’re able to use a lot of our content but wonder book finally came out. She just recently sold 12 she we have helped her repackage an offer that she has. I don’t think she’d mind me telling you she her new package charges $3,500 and she sells this package with her with her daughter. She just recently sold 12 of these in six weeks. 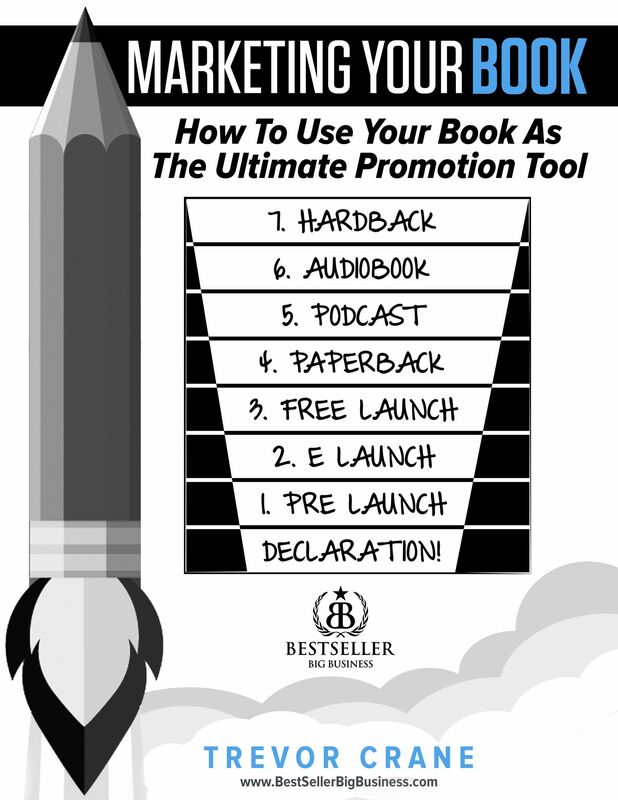 So you can do the math on that, you can see that there is a significant value in making sure you write the right book that becomes a powerful marketing tool to help you monetize your message. So when it comes down to our phone call together, there’s a lot of things that people typically want to talk to me about. And one of them is they will start to tell me their story and say, Trevor, this is my idea for the book, or this is why I want to talk to you and I want to tell you, yada, yada, yada, but the challenges and only 15 minutes we don’t have time. So I’m not looking to talk to you about your story. I know your story is amazing. And I know that if it’s not amazing yet, we’re going to make it amazing that that is easy to do. I can help you with that. But the first thing I’m going to want to know is what I’ve talked to you about so far. Number one, I want to know X marks the spot. Where are you? Are you more like Lisa where you have an idea? Are you more like Steve where you’ve written some of your manuscript or you like Mimi where the book is all done? Or maybe fall into another category, I’m not sure. 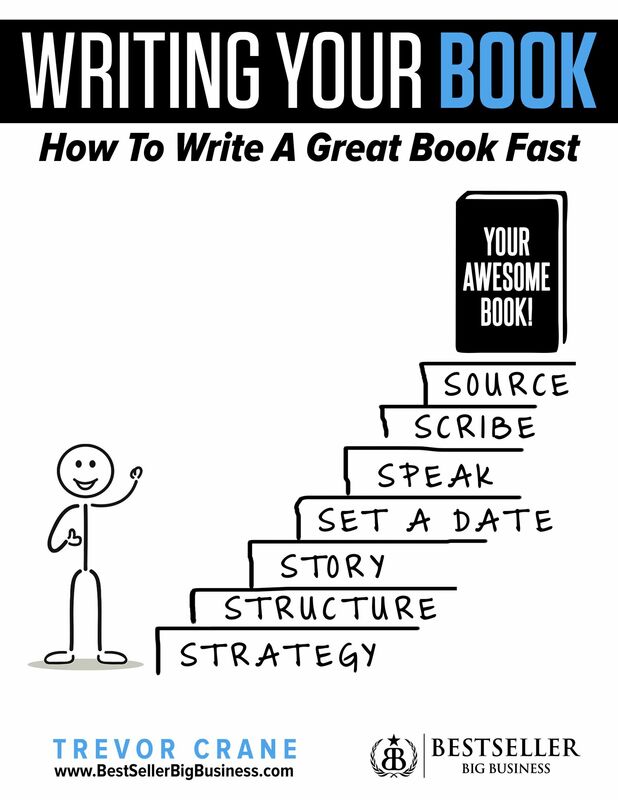 Why is it so important for you to get this book done now? Why now? Why? Now? Why, after all the time that you probably spent thinking about this, or maybe it just came up for you? Why is it important for you to do this now? What is this going to mean to you? What do you want? What’s the ideal result that you’re looking for with your book? Now we can get some clarity around this we can get some insight into what you should have for your blueprint and you’ll get the most out of our time together so on the thank you for your time today. I look forward to speaking with you now. Hope you found value from this so that when we jump on the phone call, we don’t get caught up in and I love you, but I don’t need to hear all about your story. Well, we’ll talk all about that and we’ll we’ll lose the opportunity to talk about where you are. Why this is so important for you and where you really want to go. And then we’ll create a quick plan to help you get there. And I have an insight for you. When you’re going to build a great house to get a blueprint first, then you go ahead and get a team of people to help you get your book done. Because you don’t have to be alone to to write your book that that’s like you’re not Hemingway, you don’t have to go on the woods on the six month sabbatical. Sometimes the best, actually, I believe the best time to write your book is right now, in the middle of your busy schedule. And if you’d want to talk to me about not doing a book and you’re like, why am I paying attention to this? You know what a lot of my messaging and marketing when I’m helping people grow their business has the same premise of building your brand and communicating with the world. So I know you’re going to enjoy our time together. And again, I can’t wait to speak with you. So I’ll talk to on the phone here real quick for 15 minutes. Alright, see you soon.